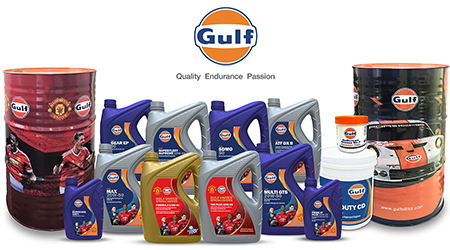 Gulf Oil, a company with a heritage of more than a century, is currently the fastest growing lubricant brand in the world. Gulf Oil was founded in 1901 with the discovery of oil at Spindle Top, Texas, when it drilled the world’s first oil well, and has now evolved into a global brand with a footprint in more than 100 countries. Today Gulf Oil has blending plants & fuel retail stations in 20 countries, and adding to its global stature is Gulf Marine which is present in 1000 ports across 80 countries. Gulf Oil Middle East Ltd. (GOMEL) is a wholly-owned subsidiary of Gulf Oil International, and was established in Jebel Ali Free Zone, Dubai in 1986. GOMEL operates two state-of-the-art lubricant blending plants in Jebel Ali and Ras Al Khaimah (RAK) with a combined capacity of 140,000 metric tonnes per annum, with the RAK Plant also having a unique grease blending facility. Gulf Oil Middle East is the first lubricant company in Middle East to have ISO 17025 accreditation by DAC, an internationally-recognised accreditation body. It also has ISO 9001, ISO 14001, ISO 17025 & OHSAS 18001 certifications.